When your corn harvest all comes in at once or you pick up a bargain bushel at your local farmers market, freezing is a great way to preserve the extra ears you can't eat immediately. Instead of heating up the kitchen with a big pot of boiling water, you can use a safe method to freeze the corn without blanching. Though most food preservation experts recommend blanching by cooking the corn in boiling water for a few minutes, you can skip that step and still maintain the flavor of your frozen corn on the cob. The sooner you can freeze the corn on the cob, the more of the flavor you capture with freezing. Pick corn on the cob from the garden early in the day to get that just-picked flavor and to allow yourself time to freeze the corn the same day you pick it. 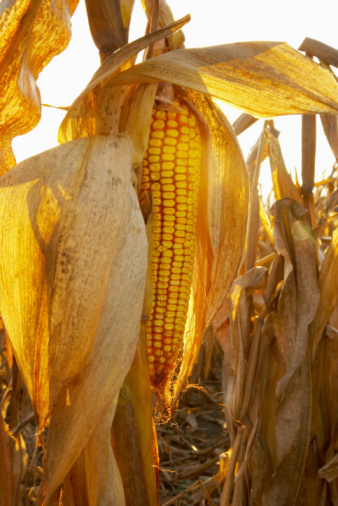 If you buy your corn on the cob, look for a stand selling fresh, local corn when possible. You don't have to blanch the corn with this method, but you do need to do a little prep work. Leave the husks on the corn before you freeze it. Trim any corn silk and ragged husk ends from the cob with a knife or scissors. Before bagging the corn, you want to freeze the ears individually to prevent them from sticking together. Place the corn on the cob, husks and all, into the freezer, laying the ears flat on a cookie sheet in a single layer. Freeze the corn for 48 hours before removing it from the freezer for packaging. After the initial freeze, you want to store your prepped corn in an airtight container to protect it from freezer burn. Place the frozen corn on the cob into freezer bags or rigid containers. You can fill the bags, or put just the number of cobs you might eat in a meal in each bag for quick prep. Label each bag with the date, so you know how long it's been in the freezer. Place the frozen corn on the cob back into the freezer. It's best to use the frozen corn within four months to avoid changes in the texture and flavor. When you grab corn from the freezer, check the dates, and use the oldest corn first. Leaving the husks on the ears of corn is the easiest method, but you can also remove the husks if you prefer. This method makes prep easier when you use the corn since the ears are ready to go. Remove the husks as you would if you were going to cook the corn. Pull off the silk. You can wash the ears of corn or freeze them without washing. If you do wash them, let the ears dry completely before you put them in the freezer. Once dry, you can follow the same freezing steps as you use for corn still in the husk.